Serge Ibaka blocks a shot by Grizzlie forward Zach Randolph. Ibaka blocked three shots Wednesday night. Andre Roberson dribbles past Memphis' Mike Conley during first-half action. Reggie Jackson thrills the crowd with a slam dunk. Kevin Durant make a move to get by Zach Randolph. Durant finished with a game-high 26 points and 10 rebounds. Russell Westbrook shoots over the outstretched hands of a Memphis defender. Dion Waiters shoots over Memphis' Tony Allen. 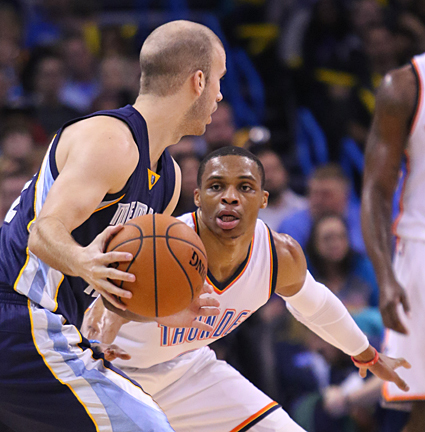 Russell Westbrook dribbles past Mike Conley during Wednesday's Western Conference matchup. Russell Westbrook defends a Memphis player Wednesday. Westbrook finished with 24 points, nine rebounds and nine assists. From start to finish, Oklahoma City controlled the Memphis Grizzlies while posting an impressive 105-89 win Wednesday at the Chesapeake Energy Arena. Memphis, the No. 2 team in the Western Conference, was limited to 37 percent shooting by an aggressive and physical Thunder defense that held Grizzlie stars Zach Randolph and Marc Gasol to a combined 24 points on seven of 25 shots. Memphis (39-14) hit only two of 12 three-point shots and were outrebounded 49-42 by Oklahoma City (28-25). Meanwhile, the Thunder had little trouble on the offensive end either, especially during the first half scoring 35 points in the first quarter and 31 in the second quarter. Oklahoma City held a 35-26 lead after the first quarter, but Memphis rallied to within three points on three occasions, but that was as close as the Grizzlies would get the rest of the game. Leading 45-42 midway through the second quarter, the Thunder outscored Memphis 21-6 to take a 66-48 halftime advantage. During that stretch, Kevin Durant knocked down a pair of treys while Russell Westbrook and Serge Ibaka combined for seven six free throws at the end of the half. From that point, the Oklahoma City lead was never fewer than 11 points. However, the final box score shows Memphis outscored the Thunder in the paint, 46-40. Durant was Oklahoma City’s leading scorer with 26 points on nine of 15 shots, including four of six from behind the arc. Durant was the Thunder’s leading rebounder with 10, notching another double-double for the season. Westbrook tallied 24, but most of his success came at the free throw line hitting 15 of 15 attempts. Westbrook also had nine assists and nine rebounds. Nick Collison scored 15 points and grabbed nine rebounds while Dion Waiters added 11 points on five of nine shots. However, neither offense shined in the second half as Memphis outscored Oklahoma City 41-39. The win pushed Oklahoma City into ninth place in the Western Conference and ½ game behind Phoenix, which holds the eighth playoff spot in the West. Phoenix lost its last two games while the Thunder has won three in a row, including a 131-108 victory over the Los Angeles Clippers, which currently holds the No. 7 spot in the West. Durant left the game late in the fourth quarter and was later seen icing his right foot, which was surgically repaired before the season started. After the game, Brooks said the icing was a precaution and that Durant has experienced soreness in that foot since returning to the lineup. So far, Brooks said, all of the tests and X-rays on Durant’s foot have been negative. Brooks was non-committal when asked if Durant would play in Sunday’s All-Star Game in New York. Durant and Westbrook were selected as reserves for the Western Conference squad. Memphis was led in scoring by Zach Randolph with 16 followed by former Thunder player Jeff Green with 11. GAME NOTES: Memphis scored more second-chance points than Oklahoma City, 12-9, but the Thunder tallied more fast break points, 24-4….The Thunder also grabbed more rebounds, 49-42….Durant and Ibaka each blocked three shots while Collison swatted away two Memphis shots….During his post-game press conference, Brooks joked he would miss the Oklahoma City media during the All-Star break. “Yeah, I’m gonna miss you guys during the next 10 days,” he said.